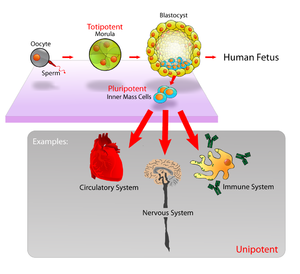 Embryonic stem cells (ES cells or ESCs) are pluripotent stem cells derived from the inner cell mass of a blastocyst, an early-stage pre-implantation embryo. Human embryos reach the blastocyst stage 4–5 days post fertilization, at which time they consist of 50–150 cells. Isolating the embryoblast, or inner cell mass (ICM) results in destruction of the blastocyst, a process which raises ethical issues, including whether or not embryos at the pre-implantation stage should have the same moral considerations as embryos in the post-implantation stage of development. Researchers are currently focusing heavily on the therapeutic potential of embryonic stem cells, with clinical use being the goal for many labs. Potential uses include the treatment of diabetes and heart disease. The cells are being studied to be used as clinical therapies, models of genetic disorders, and cellular/DNA repair. However, adverse effects in the research and clinical processes such as tumours and unwanted immune responses have also been reported. Embryonic stem cells (ESCs), derived from the blastocyst stage of early mammalian embryos, are distinguished by their ability to differentiate into any cell type and by their ability to propagate. It is these traits that makes them valuable in the scientific and medical fields. ESCs are also described as having a normal karyotype, maintaining high telomerase activity, and exhibiting remarkable long-term proliferative potential. Researchers have differentiated ESCs into dopamine-producing cells with the hope that these neurons could be used in the treatment of Parkinson’s disease. ESCs have been differentiated to natural killer (NK) cells and bone tissue. Studies involving ESCs are underway to provide an alternative treatment for diabetes. For example, D’Amour et al. were able to differentiate ESCs into insulin producing cells and researchers at Harvard University were able to produce large quantities of pancreatic beta cells from ES. An article published in the European Heart Journal describes a translational process of generating human embryonic stem cell-derived cardiac progenitor cells to be used in clinical trials of patients with severe heart failure. Differentiated somatic cells and ES cells use different strategies for dealing with DNA damage. For instance, human foreskin fibroblasts, one type of somatic cell, use non-homologous end joining (NHEJ), an error prone DNA repair process, as the primary pathway for repairing double-strand breaks (DSBs) during all cell cycle stages. Because of its error-prone nature, NHEJ tends to produce mutations in a cell’s clonal descendants. ES cells use a different strategy to deal with DSBs. Because ES cells give rise to all of the cell types of an organism including the cells of the germ line, mutations arising in ES cells due to faulty DNA repair are a more serious problem than in differentiated somatic cells. Consequently, robust mechanisms are needed in ES cells to repair DNA damages accurately, and if repair fails, to remove those cells with un-repaired DNA damages. Thus, mouse ES cells predominantly use high fidelity homologous recombinational repair (HRR) to repair DSBs. This type of repair depends on the interaction of the two sister chromosomes formed during S phase and present together during the G2 phase of the cell cycle. HRR can accurately repair DSBs in one sister chromosome by using intact information from the other sister chromosome. Cells in the G1 phase of the cell cycle (i.e. after metaphase/cell division but prior the next round of replication) have only one copy of each chromosome (i.e. sister chromosomes aren’t present). Mouse ES cells lack a G1 checkpoint and do not undergo cell cycle arrest upon acquiring DNA damage. Rather they undergo programmed cell death (apoptosis) in response to DNA damage. Apoptosis can be used as a fail-safe strategy to remove cells with un-repaired DNA damages in order to avoid mutation and progression to cancer. Consistent with this strategy, mouse ES stem cells have a mutation frequency about 100-fold lower than that of isogenic mouse somatic cells. In November 2011 Geron announced it was halting the trial and dropping out of stem cell research for financial reasons, but would continue to monitor existing patients, and was attempting to find a partner that could continue their research. In 2013 BioTime, led by CEO Dr. Michael D. West, acquired all of Geron's stem cell assets, with the stated intention of restarting Geron's embryonic stem cell-based clinical trial for spinal cord injury research. BioTime company Asterias Biotherapeutics (NYSE MKT: AST) was granted a $14.3 million Strategic Partnership Award by the California Institute for Regenerative Medicine (CIRM) to re-initiate the world’s first embryonic stem cell-based human clinical trial, for spinal cord injury. Supported by California public funds, CIRM is the largest funder of stem cell-related research and development in the world. AST-OPC1 is a population of cells derived from human embryonic stem cells (hESCs) that contains oligodendrocyte progenitor cells (OPCs). OPCs and their mature derivatives called oligodendrocytes provide critical functional support for nerve cells in the spinal cord and brain. Asterias recently presented the results from phase 1 clinical trial testing of a low dose of AST-OPC1 in patients with neurologically-complete thoracic spinal cord injury. The results showed that AST-OPC1 was successfully delivered to the injured spinal cord site. Patients followed 2–3 years after AST-OPC1 administration showed no evidence of serious adverse events associated with the cells in detailed follow-up assessments including frequent neurological exams and MRIs. Immune monitoring of subjects through one year post-transplantation showed no evidence of antibody-based or cellular immune responses to AST-OPC1. In four of the five subjects, serial MRI scans performed throughout the 2–3 year follow-up period indicate that reduced spinal cord cavitation may have occurred and that AST-OPC1 may have had some positive effects in reducing spinal cord tissue deterioration. There was no unexpected neurological degeneration or improvement in the five subjects in the trial as evaluated by the International Standards for Neurological Classification of Spinal Cord Injury (ISNCSCI) exam. The Strategic Partnership III grant from CIRM will provide funding to Asterias to support the next clinical trial of AST-OPC1 in subjects with spinal cord injury, and for Asterias’ product development efforts to refine and scale manufacturing methods to support later-stage trials and eventually commercialization. CIRM funding will be conditional on FDA approval for the trial, completion of a definitive agreement between Asterias and CIRM, and Asterias’ continued progress toward the achievement of certain pre-defined project milestones. The main strategy to enhance the safety of ESC for potential clinical use is to differentiate the ESC into specific cell types (e.g. neurons, muscle, liver cells) that have reduced or eliminated ability to cause tumors. Following differentiation, the cells are subjected to sorting by flow cytometry for further purification. ESC are predicted to be inherently safer than IPS cells created with genetically-integrating viral vectors because they are not genetically modified with genes such as c-Myc that are linked to cancer. Nonetheless, ESC express very high levels of the iPS inducing genes and these genes including Myc are essential for ESC self-renewal and pluripotency, and potential strategies to improve safety by eliminating c-Myc expression are unlikely to preserve the cells' "stemness". However, N-myc and L-myc have been identified to induce iPS cells instead of c-myc with similar efficiency. More recent protocols to induce pluripotency bypass these problems completely by using non-integrating RNA viral vectors such as sendai virus or mRNA transfection. Due to the nature of embryonic stem cell research, there are a lot of controversial opinions on the topic. Since harvesting embryonic stem cells necessitates destroying the embryo from which those cells are obtained, the moral status of the embryo comes into question. Some people argue that the 5-day old mass of cells is too young to achieve personhood or that the embryo, if donated from an IVF clinic (which is where labs typically acquire embryos from), would otherwise go to medical waste anyway. Opponents of ESC research counter that any embryo has the potential to become a human, therefore destroying it is murder and the embryo must be protected under the same ethical view as a developed human being. 1964: Lewis Kleinsmith and G. Barry Pierce Jr. isolated a single type of cell from a teratocarcinoma, a tumor now known to be derived from a germ cell. These cells isolated from the teratocarcinoma replicated and grew in cell culture as a stem cell and are now known as embryonal carcinoma (EC) cells. Although similarities in morphology and differentiating potential (pluripotency) led to the use of EC cells as the in vitro model for early mouse development, EC cells harbor genetic mutations and often abnormal karyotypes that accumulated during the development of the teratocarcinoma. These genetic aberrations further emphasized the need to be able to culture pluripotent cells directly from the inner cell mass. 1981: Embryonic stem cells (ES cells) were independently first derived from mouse embryos by two groups. Martin Evans and Matthew Kaufman from the Department of Genetics, University of Cambridge published first in July, revealing a new technique for culturing the mouse embryos in the uterus to allow for an increase in cell number, allowing for the derivation of ES cells from these embryos. Gail R. Martin, from the Department of Anatomy, University of California, San Francisco, published her paper in December and coined the term “Embryonic Stem Cell”. She showed that embryos could be cultured in vitro and that ES cells could be derived from these embryos. 1989: Mario R. Cappechi, Martin J. Evans, and Oliver Smithies publish their research which details their isolation and genetic modifications of embryonic stem cells, creating the first "knockout mice". In creating knockout mice, this publication provided scientists with an entirely new way to study disease. 1998: A paper titled "Embryonic Stem Cell Lines Derived From Human Blastocysts" is published by a team from the University of Wisconsin, Madison. The researchers behind this study not only create the first embryonic stem cells, but recognize their pluripotency, as well as their capacity for self-renewal. The abstract of the paper notes the significance of the discovery with regards to the fields of developmental biology and drug discovery. 2001: President George W. Bush allows federal funding to support research on roughly 60—at this time, already existing—lines of embryonic stem cells. Seeing as the limited lines that Bush allowed research on had already been established, this law supported embryonic stem cell research without raising any ethical questions that could arise with the creation of new lines under federal budget. 2006: Japanese scientists Shinya Yamanaka and Kazutoshi Takashi publish a paper describing the induction of pluripotent stem cells from cultures of adult mouse fibroblasts. Induced pluripotent stem cells (iPSCs) are a huge discovery, as they are seemingly identical to embryonic stem cells and could be used without sparking the same moral controversy. January, 2009: The US Food and Drug Administration (FDA) provides approval for Geron Corporation's phase I trial of their human embryonic stem cell-derived treatment for spinal cord injuries. The announcement was met with excitement from the scientific community, but also with wariness from stem cell opposers. The treatment cells were, however, derived from the cell lines approved under George W. Bush's ESC policy. March, 2009: Executive Order 13505 is signed by President Barack Obama, removing the restrictions put in place on federal funding for human stem cells by the previous presidential administration. This would allow the National Institutes of Health (NIH) to provide funding for hESC research. The document also states that the NIH must provide revised federal funding guidelines within 120 days of the order's signing. Embryonic stem cells are derived from the inner cell mass of the early embryo, which are harvested from the donor mother animal. Martin Evans and Matthew Kaufman reported a technique that delays embryo implantation, allowing the inner cell mass to increase. This process includes removing the donor mother's ovaries and dosing her with progesterone, changing the hormone environment, which causes the embryos to remain free in the uterus. After 4–6 days of this intrauterine culture, the embryos are harvested and grown in in vitro culture until the inner cell mass forms “egg cylinder-like structures,” which are dissociated into single cells, and plated on fibroblasts treated with mitomycin-c (to prevent fibroblast mitosis). Clonal cell lines are created by growing up a single cell. Evans and Kaufman showed that the cells grown out from these cultures could form teratomas and embryoid bodies, and differentiate in vitro, all of which indicating that the cells are pluripotent. ^ Thomson; Itskovitz-Eldor, J; Shapiro, SS; Waknitz, MA; Swiergiel, JJ; Marshall, VS; Jones, JM (1998). "Blastocysts Embryonic Stem Cell Lines Derived from Human". Science. 282 (5391): 1145–1147. Bibcode:1998Sci...282.1145T. doi:10.1126/science.282.5391.1145. PMID 9804556. ^ a b "NIH Stem Cell Basics. What are embryonic stem cells?". ^ Baldwing A (2009). "Morality and human embryo research. Introduction to the Talking Point on morality and human embryo research". EMBO Reports. 10 (4): 299–300. doi:10.1038/embor.2009.37. PMC 2672902. PMID 19337297. ^ Nakaya, Andrea C. (August 1, 2011). Biomedical ethics. San Diego, CA: ReferencePoint Press. p. 96. ISBN 978-1601521576. ^ a b "Introduction: What are stem cells, and why are they important?". National Institutes of Health. Retrieved 28 October 2018. ^ Carla A Herberts; Marcel SG Kwa; Harm PH Hermsen (2011). "Risk factors in the development of stem cell therapy". Journal of Translational Medicine. 9 (29): 29. doi:10.1186/1479-5876-9-29. PMC 3070641. PMID 21418664. ^ a b Thomson, J. A.; Itskovitz-Eldor, J; Shapiro, S. S.; Waknitz, M. A.; Swiergiel, J. J.; Marshall, V. S.; Jones, J. M. (1998). "Embryonic Stem Cell Lines Derived from Human Blastocysts". Science. 282 (5391): 1145–7. Bibcode:1998Sci...282.1145T. doi:10.1126/science.282.5391.1145. PMID 9804556. ^ Ying; Nichols, J; Chambers, I; Smith, A (2003). "BMP Induction of Id Proteins Suppresses Differentiation and Sustains Embryonic Stem Cell Self-Renewal in Collaboration with STAT3". Cell. 115 (3): 281–292. doi:10.1016/S0092-8674(03)00847-X. PMID 14636556. ^ Mahla, Ranjeet (July 19, 2016). "Stem Cell Applications in Regenerative Medicine and Disease Therapeutics". International Journal of Cell Biology. 2016: 6940283. doi:10.1155/2016/6940283. PMC 4969512. PMID 27516776. ^ Levenberg, S. (2002). "Endothelial cells derived from human embryonic stem cells". Proceedings of the National Academy of Sciences. 99 (7): 4391–4396. Bibcode:2002PNAS...99.4391L. doi:10.1073/pnas.032074999. PMC 123658. PMID 11917100. ^ a b Davila, JC; Cezar, GG; Thiede, M; Strom, S; Miki, T; Trosko, J (2004). "Use and application of stem cells in toxicology". Toxicological Sciences. 79 (2): 214–23. doi:10.1093/toxsci/kfh100. PMID 15014205. ^ Siu, CW; Moore, JC; Li, RA (2007). "Human embryonic stem cell-derived cardiomyocytes for heart therapies". Cardiovascular & Hematological Disorders Drug Targets. 7 (2): 145–52. doi:10.2174/187152907780830851. PMID 17584049. ^ Perrier, A. L. (2004). "Derivation of midbrain dopamine neurons from human embryonic stem cells". Proceedings of the National Academy of Sciences. 101 (34): 12543–12548. Bibcode:2004PNAS..10112543P. doi:10.1073/pnas.0404700101. PMC 515094. PMID 15310843. ^ Parish, CL; Arenas, E (2007). "Stem-cell-based strategies for the treatment of Parkinson's disease". Neuro-Degenerative Diseases. 4 (4): 339–47. doi:10.1159/000101892. PMID 17627139. ^ Waese, EY; Kandel, RA; Stanford, WL (2008). "Application of stem cells in bone repair". Skeletal Radiology. 37 (7): 601–8. doi:10.1007/s00256-007-0438-8. PMID 18193216. ^ d'Amour, KA; Bang, AG; Eliazer, S; Kelly, OG; Agulnick, AD; Smart, NG; Moorman, MA; Kroon, E; Carpenter, MK; Baetge, EE (2006). "Production of pancreatic hormone-expressing endocrine cells from human embryonic stem cells". Nature Biotechnology. 24 (11): 1392–401. doi:10.1038/nbt1259. PMID 17053790. ^ Menasché, Phillip; Vanneaux, Valérie; Fabreguettes, Jean-Roch; Bel, Alain; Tosca, Lucie; Garcia, Sylvie (21 March 2015). "Towards a clinical use of human embryonic stem cell derived-cardiac progenitors: a translational experience". European Heart Journal. 36 (12): 743–750. doi:10.1093/eurheartj/ehu192. PMID 24835485. ^ Jensen, J; Hyllner, J; Björquist, P (2009). "Human embryonic stem cell technologies and drug discovery". Journal of Cellular Physiology. 219 (3): 513–9. doi:10.1002/jcp.21732. PMID 19277978. ^ Söderdahl, T; Küppers-Munther, B; Heins, N; Edsbagge, J; Björquist, P; Cotgreave, I; Jernström, B (2007). "Glutathione transferases in hepatocyte-like cells derived from human embryonic stem cells". Toxicology in Vitro. 21 (5): 929–37. doi:10.1016/j.tiv.2007.01.021. PMID 17346923. ^ Mao Z, Bozzella M, Seluanov A, Gorbunova V (September 2008). "DNA repair by nonhomologous end joining and homologous recombination during cell cycle in human cells". Cell Cycle. 7 (18): 2902–6. doi:10.4161/cc.7.18.6679. PMC 2754209. PMID 18769152. ^ a b Tichy ED, Pillai R, Deng L, et al. (November 2010). "Mouse embryonic stem cells, but not somatic cells, predominantly use homologous recombination to repair double-strand DNA breaks". Stem Cells Dev. 19 (11): 1699–711. doi:10.1089/scd.2010.0058. PMC 3128311. PMID 20446816. ^ Hong Y, Stambrook PJ (October 2004). "Restoration of an absent G1 arrest and protection from apoptosis in embryonic stem cells after ionizing radiation". Proc. Natl. Acad. Sci. U.S.A. 101 (40): 14443–8. Bibcode:2004PNAS..10114443H. doi:10.1073/pnas.0401346101. PMC 521944. PMID 15452351. ^ Aladjem MI, Spike BT, Rodewald LW, et al. (January 1998). "ES cells do not activate p53-dependent stress responses and undergo p53-independent apoptosis in response to DNA damage". Curr. Biol. 8 (3): 145–55. doi:10.1016/S0960-9822(98)70061-2. PMID 9443911. ^ Bernstein C, Bernstein H, Payne CM, Garewal H (June 2002). "DNA repair/pro-apoptotic dual-role proteins in five major DNA repair pathways: fail-safe protection against carcinogenesis". Mutat. Res. 511 (2): 145–78. doi:10.1016/S1383-5742(02)00009-1. PMID 12052432. ^ Cervantes RB, Stringer JR, Shao C, Tischfield JA, Stambrook PJ (March 2002). "Embryonic stem cells and somatic cells differ in mutation frequency and type". Proc. Natl. Acad. Sci. U.S.A. 99 (6): 3586–90. Bibcode:2002PNAS...99.3586C. doi:10.1073/pnas.062527199. PMC 122567. PMID 11891338. ^ "FDA approves human embryonic stem cell study - CNN.com". January 23, 2009. Retrieved May 1, 2010. ^ Keirstead HS, Nistor G, Bernal G, et al. (2005). "Human embryonic stem cell-derived oligodendrocyte progenitor cell transplants remyelinate and restore locomotion after spinal cord injury". J. Neurosci. 25 (19): 4694–705. doi:10.1523/JNEUROSCI.0311-05.2005. PMID 15888645. ^ Vergano, Dan (11 October 2010). "Embryonic stem cells used on patient for first time". USA Today. Retrieved 12 October 2010. ^ Brown, Eryn (November 15, 2011). "Geron exits stem cell research". LA Times. Retrieved 2011-11-15. ^ "Great news: BioTime Subsidiary Asterias Acquires Geron Embryonic Stem Cell Program". iPScell.com. October 1, 2013. ^ a b c d California Institute of Regenerative Medicine. BioTime, Inc.
^ Knoepfler, Paul S. (2009). "Deconstructing Stem Cell Tumorigenicity: A Roadmap to Safe Regenerative Medicine". Stem Cells. 27 (5): 1050–6. doi:10.1002/stem.37. PMC 2733374. PMID 19415771. ^ Varlakhanova, Natalia V.; Cotterman, Rebecca F.; Devries, Wilhelmine N.; Morgan, Judy; Donahue, Leah Rae; Murray, Stephen; Knowles, Barbara B.; Knoepfler, Paul S. (2010). "Myc maintains embryonic stem cell pluripotency and self-renewal". Differentiation. 80 (1): 9–19. doi:10.1016/j.diff.2010.05.001. PMC 2916696. PMID 20537458. ^ Wernig, Marius; Meissner, Alexander; Cassady, John P; Jaenisch, Rudolf (2008). "C-Myc is Dispensable for Direct Reprogramming of Mouse Fibroblasts". Cell Stem Cell. 2 (1): 10–2. doi:10.1016/j.stem.2007.12.001. PMID 18371415. ^ King, Nancy; Perrin, Jacob (July 7, 2014). "Ethical issues in stem cell research and therapy". Stem Cell Research and Therapy. 5 (4): 85. doi:10.1186/scrt474. PMC 4097842. ^ Kleinsmith LJ, Pierce GB Jr (1964). "Multipotentiality of Single Embryoncal Carcinoma Cells". Cancer Res. 24: 1544–51. PMID 14234000. ^ Andrews P, Matin M, Bahrami A, Damjanov I, Gokhale P, Draper J (2005). "Embryonic stem (ES) cells and embryonal carcinoma (EC) cells: opposite sides of the same coin" (PDF). Biochem Soc Trans. 33 (Pt 6): 1526–30. doi:10.1042/BST20051526. PMID 16246161. ^ Martin GR (1980). "Teratocarcinomas and mammalian embryogenesis". Science. 209 (4458): 768–76. Bibcode:1980Sci...209..768M. doi:10.1126/science.6250214. PMID 6250214. ^ a b Evans M, Kaufman M (1981). "Establishment in culture of pluripotent cells from mouse embryos". Nature. 292 (5819): 154–6. Bibcode:1981Natur.292..154E. doi:10.1038/292154a0. PMID 7242681. ^ a b Martin G (1981). "Isolation of a pluripotent cell line from early mouse embryos cultured in medium conditioned by teratocarcinoma stem cells". Proc Natl Acad Sci USA. 78 (12): 7634–8. Bibcode:1981PNAS...78.7634M. doi:10.1073/pnas.78.12.7634. PMC 349323. PMID 6950406. ^ "The 2007 Nobel Prize in Physiology or Medicine - Advanced Information". Nobel Prize. Nobel Media. ^ Thompson, James A.; Itskovitz-Eldor, Joseph; Shapiro, Sander S.; Waknitz, Michelle A.; Swiergiel, Jennifer J.; Marshall, Vivienne S.; Jones, Jeffrey M. (6 November 1998). "Embryonic Stem Cell Lines Derived From Human Blastocyst". Science. 282 (5391): 1145–1147. Bibcode:1998Sci...282.1145T. doi:10.1126/science.282.5391.1145. ^ "President George W. Bush's address on stem cell research". CNN Inside Politics. CNN. Aug 9, 2001. ^ Yamanaka, Shinya; Takahashi, Kazutoshi (25 Aug 2006). "Induction of Pluripotent Stem Cells From Mouse Embryonic and Adult Fibroblast Cultures by Defined Factors". Cell. 126 (4): 663–676. doi:10.1016/j.cell.2006.07.024. PMID 16904174. ^ Wadman, Meredith (27 January 2009). "Stem cells ready for primetime". Nature. Nature. 457 (7229): 516. doi:10.1038/457516a. PMID 19177087. ^ "Executive Order 13505—Removing Barriers To Responsible Scientific Research Involving Human Stem Cells" (PDF). Federal Register: Presidential Documents. 74 (46). 11 March 2009. ^ Mountford, JC (2008). "Human embryonic stem cells: origins, characteristics and potential for regenerative therapy". Transfus Med. 18 (1): 1–12. doi:10.1111/j.1365-3148.2007.00807.x. PMID 18279188. ^ Thomson JA, Itskovitz-Eldor J, Shapiro SS, Waknitz MA, Swiergiel JJ, Marshall VS, Jones JM (1998). "Embryonic stem cell lines derived from human blastocysts". Science. 282 (5391): 1145–1147. Bibcode:1998Sci...282.1145T. doi:10.1126/science.282.5391.1145. PMID 9804556. ^ Smith AG, Heath JK, Donaldson DD, Wong GG, Moreau J, Stahl M, Rogers D (1988). "Inhibition of pluripotential embryonic stem cell differentiation by purified polypeptides". Nature. 336 (6200): 688–690. Bibcode:1988Natur.336..688S. doi:10.1038/336688a0. PMID 3143917. ^ Williams RL, Hilton DJ, Pease S, Willson TA, Stewart CL, Gearing DP, Wagner EF, Metcalf D, Nicola NA, Gough NM (1988). "Myeloid leukaemia inhibitory factor maintains the developmental potential of embryonic stem cells". Nature. 336 (6200): 684–687. Bibcode:1988Natur.336..684W. doi:10.1038/336684a0. PMID 3143916. ^ Ledermann B, Bürki K (1991). "Establishment of a germ-line competent C57BL/6 embryonic stem cell line". Exp Cell Res. 197 (2): 254–258. doi:10.1016/0014-4827(91)90430-3. PMID 1959560. ^ Takahashi K, Tanabe K, Ohnuki M, Narita M, Ichisaka T, Tomoda K, Yamanaka S (2007). "Induction of pluripotent stem cells from adult human fibroblasts by defined factors". Cell. 131 (5): 861–872. doi:10.1016/j.cell.2007.11.019. PMID 18035408. ^ Klimanskaya I, Chung Y, Becker S, Lu SJ, Lanza R (2006). "Human embryonic stem cell lines derived from single blastomeres". Nature. 444 (7118): 481–5. Bibcode:2006Natur.444..481K. doi:10.1038/nature05142. PMID 16929302. ^ Takahashi, K; Yamanaka, S (2006). "Induction of pluripotent stem cells from mouse embryonic and adult fibroblast cultures by defined factors". Cell. 126 (4): 663–76. doi:10.1016/j.cell.2006.07.024. PMID 16904174. ^ Wernig, Marius; Meissner, Alexander; Foreman, Ruth; Brambrink, Tobias; Ku, Manching; Hochedlinger, Konrad; Bernstein, Bradley E.; Jaenisch, Rudolf (2007-07-19). "In vitro reprogramming of fibroblasts into a pluripotent ES-cell-like state". Nature. 448 (7151): 318–324. Bibcode:2007Natur.448..318W. doi:10.1038/nature05944. ISSN 1476-4687. PMID 17554336. ^ "Embryonic stem cells made without embryos". Reuters. 2007-11-21. ^ Weiss, Rick (2007-12-07). "Scientists Cure Mice Of Sickle Cell Using Stem Cell Technique: New Approach Is From Skin, Not Embryos". The Washington Post. pp. A02. ^ Hanna, J.; Wernig, M.; Markoulaki, S.; Sun, C.-W.; Meissner, A.; Cassady, J. P.; Beard, C.; Brambrink, T.; Wu, L.-C.; Townes, T. M.; Jaenisch, R. (2007). "Treatment of Sickle Cell Anemia Mouse Model with iPS Cells Generated from Autologous Skin". Science. 318 (5858): 1920–3. Bibcode:2007Sci...318.1920H. doi:10.1126/science.1152092. PMID 18063756. ^ Helen Briggs (2008-01-17). "US team makes embryo clone of men". BBC. pp. A01. ^ Ebert, Jessica (24 January 2005). "Human stem cells trigger immune attack". Nature News. London: Nature Publishing Group. doi:10.1038/news050124-1. Archived from the original on 2010-09-24. Retrieved 2009-02-27. ^ Martin MJ, Muotri A, Gage F, Varki A (2005). "Human embryonic stem cells express an immunogenic nonhuman sialic acid". Nat. Med. 11 (2): 228–32. doi:10.1038/nm1181. PMID 15685172. ^ Klimanskaya I, Chung Y, Meisner L, Johnson J, West MD, Lanza R (2005). "Human embryonic stem cells derived without feeder cells". Lancet. 365 (9471): 1636–41. doi:10.1016/S0140-6736(05)66473-2. PMID 15885296. 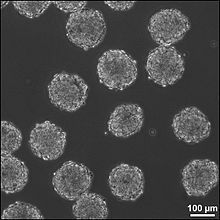 Wikimedia Commons has media related to Embryonic stem cells. This page was last edited on 6 April 2019, at 21:26 (UTC).